Hurtling towards the rapids ahead of us, their peaks and valleys rising and falling like a majestic mountain range, my heart started to beat faster. Suddenly, our boat started to climb, and then just as quickly dipped into the water below. Earlier in the day, my excitement had more resembled trepidation as I prepared for my ride on the Whirlpool Jet Boat at Niagara Falls. “A jet boat. 55 miles per hour. Through class-5 rapids.” The thoughts came one after the other. I am what most people would call a wuss; though, I like to think of myself as being someone who enjoys living more than, well, not living. Either way, hurtling through rapids, life jacket or not, isn’t something that I normally do for fun. Getting ready to leave on our jet boat at Niagara Falls. Our boat ride started out peacefully enough. As we puttered along past the moored boats in the Niagara-on-the-Lake harbor, I briefly thought to myself, “This isn’t too bad,” still knowing in the back of my head what lay ahead. Soon enough, our boat started picking up speed along the velvety-smooth Niagara River. As we hurtled towards what I was sure was impending doom, I must admit, I actually started to have a bit of fun. That’s when our guide decided to show us the Hamilton Turn, a 360-degree spin while going over 50 miles per hour. As our guide instructed everyone to raise and spin their hand in the sky, I instinctively grabbed hold of the bar in front of me. Everyone else might be okay flying into the choppy waters below, but I preferred the slightly uncomfortable confines of my seat. Of course, I should have known better. This isn’t the “anything goes” attitude of Asia. If there was even the slightest risk of harm, the Coast Guard would shut down the boats faster then you could say “Hamilton Turn”. If I’m being perfectly honest though, the turn was a lot of fun, and it was at this moment, that I went from fearing death to enjoying the ride. Through the remainder of the ride, which consisted of 2-3 more Hamilton Turns and half a dozen runs through the class-5 rapids of the Niagara River, I realized just how silly my initial fear had been. 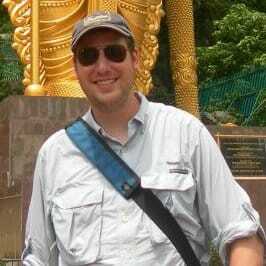 Ultimately, while I went on the press trip as an opportunity to see Niagara Falls, I came away with so much more. I learned that sometimes the things that scare us are the most fun. If you don’t step out of your comfort zone and experience life, you miss out on so much. Whether that’s something small like riding on a jet boat at Niagara Falls or something big like traveling to a foreign country, taking chances creates amazing experiences that you can’t have if you stay on the sidelines. 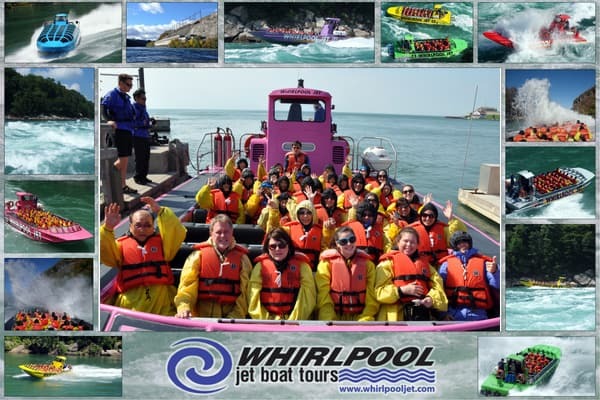 The Whirlpool Jet Boat Tours run every day from mid-April to October and last about 1 hour. Tours leave from three ports: Niagara-on-the-Lake and Niagara Falls in Ontario, Canada, and Lewiston, New York, in the United States. For more information on how you can ride on the Whirlpool Jet Boats, make sure to visit their website, or check out the video below. My Whirlpool Jet Boat experience was sponsored by Tourism Ontario and the Niagara Parks Commission. As always, the opinions expressed are my own. 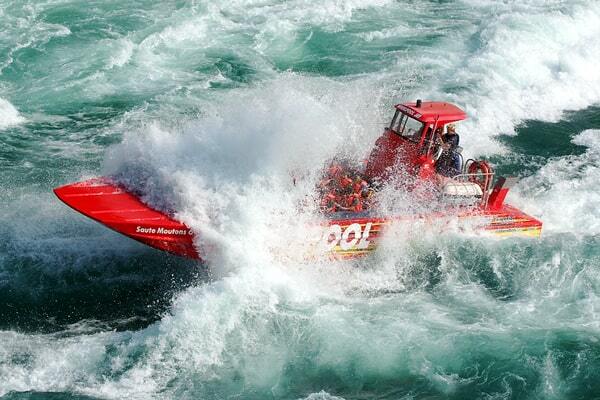 Photos and video are courtesy of Whirlpool Jet Boats at Niagara Falls.